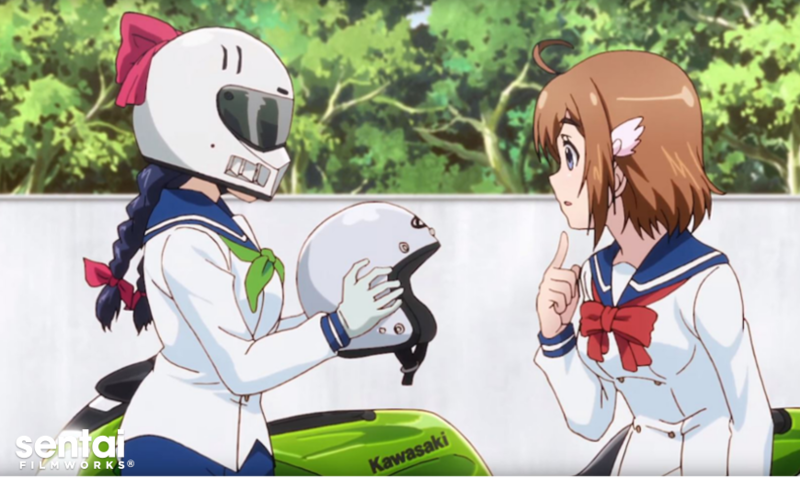 HOUSTON, March 31, 2016 – Sentai Filmworks is proud to announce its acquisition of Bakuon!! for the Spring 2016 simulcast season. Moe and motorcycles have never looked better together in this sports comedy about a group of students in the motorcycle club of their all-girls school. When Hane Sakura sees the wild-hearted Onsa Amano riding a motorcycle to school, Sakura is inspired to join the motorcycle club and get her license. However, nothing could have prepared her for the challenges, or the joys, that come with hitting the road on the wings of a real bike! The series, based on the original manga by Mimana Orimoto, was directed by Junji Nishimura (Ranma ½, GLASSIP, Dog Days) with Kurasumi Sunayama (Horizon in the Middle of Nowhere) in charge of series composition. TMS Entertainment, the same studio that produced Yowamushi Pedal, Magic Knight Rayearth, Kamisama Kiss, and Gugure! Kokkuri-san, was in charge of animation production. Bakuon!! is scheduled for an April 2016 broadcast in Japan and will soon be available for simulcast on select digital outlets, with a home video release to follow. Sentai Filmworks is a leading global supplier of anime and official anime merchandise, distributing and curating one of the industry’s most diverse libraries of top trending and classic titles. Offering thousands of hours of content across both traditional and digital platforms, Sentai is dedicated to bringing captivating stories and iconic characters directly from Japan. With hit series that include Parasyte –the maxim–, No Game, No Life, Food Wars!, Is it Wrong to Try to Pick Up Girls in a Dungeon?, and Akame Kill!, Sentai’s catalog continues to grow with new favorites like Himouto! Umaru-chan and Monster Musume: Everyday Life with Monster Girls, as well as classic anime series such as Legend of the Galactic Heroes. For more information, visit www.sentaifilmworks.com.